Most people hate the process of renewing a cell phone contract—it’s time consuming, and customers don’t always feel supported to make the decision that’s right for them. TELUS, one of Canada’s largest mobile service providers, understood the extent of their customers’ unhappiness and had concrete data to back it up. Customer experience scores relating to renewals, such as likelihood to recommend (L2R), consistently ranked among the lowest across the entire enterprise compared to other experiences, and the operational expenditure (OPEX) per customer during a renewal was high. OPEX for cell phone renewals breaks down into expense by channel. More expensive channels included TELUS stores and third-party retail, while digital renewals were much less expensive. For TELUS, a renewal completed online significantly reduced operational costs, and customers who renewed online tended to rate their experience much more favorably. Based on this data, TELUS put more resources into its web experience, improving usability and adding functionality. But even after making major digital investments to the renewals web experience, most customers were still renewing their mobile contracts by calling the TELUS call centre or visiting a retail store. To add to the pressure, in 2015 Canadian regulations were changing to allow a new maximum of two years per agreement, resulting in the discontinuation of three-year contracts. This freed many consumers to seek out new contracts, but it raised the cost burden of subsidy for providers offering hardware to customers as incentives to signing contracts, driving up the overall cost of service. TELUS was facing a big problem: more customers looking for new contracts, higher up-front hardware subsidy costs due to shorter contract periods, and customer reliance on high-cost channels. TELUS knew it needed to do something to improve the customer experience of renewals, and it partnered with Bridgeable to approach this challenge in a new way. When the project began, there was a pervasive understanding that customers tended to choose one of the available channels and stay within it to pursue a contract renewal—starting and ending by contacting the call centre, for instance. However, in talking with customers, Bridgeable found that they might, for instance, start out by calling TELUS, then do some web research, and then finally renew in person in a store. Rather than looking at their renewals service through multiple channels, TELUS needed it to operate as an omni-channel service. In fact, if customers didn’t see consistency across channels, they would often feel that they were not getting the best possible price and would escalate their effort by calling in to negotiate, thereby driving up the cost of service. 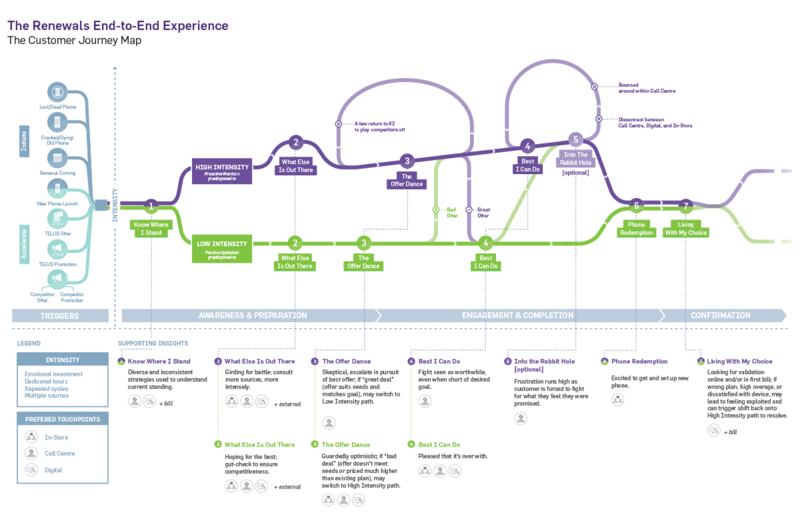 Working with TELUS’s internal Service Design and Customer Experience Management team, Bridgeable took a service design approach to the problem. Together, we assembled a cross-functional team, drawing employees from throughout the corporate organization, including managers responsible for web experience, retail, marketing, operations, and call centres, among others. With this team, we conducted customer research and synthesized an experience map that revealed two streams of customer behaviour: the “passive optimist” who goes with the flow and hopes for the best and the “proactive warrior” who always thinks a better deal is around the corner on the next call or in a TELUS store. Because of this customer tendency to fight for the best offer and to play one channel against another, we needed to design a service where all of the channels fit together seamlessly and consistently during a renewal experience. For each channel—in-store, phone call, website, email offer, and actually unboxing the new phone—we focused on a series of prototypes that would work together to create the entire end-to-end experience. 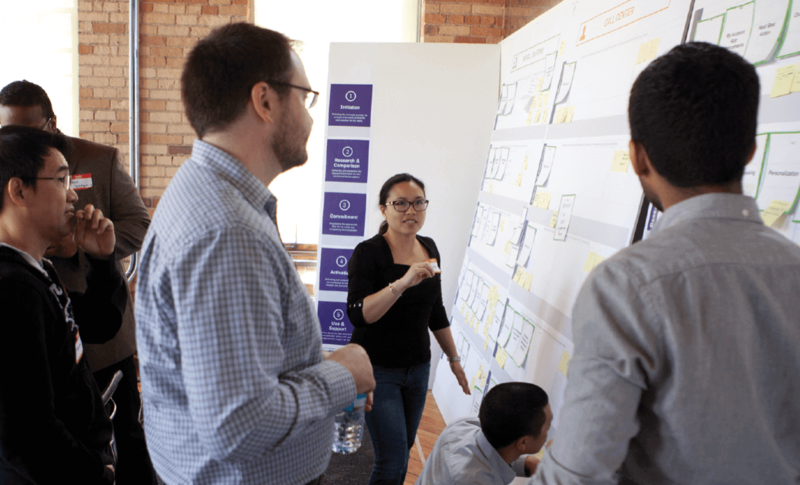 To ensure our prototypes would be user-centred and implementable, we needed to co-create our solutions with customers and a wide variety of staff. For the first time in TELUS’s history, we brought staff from multiple channels together with executives and customers to co-create solutions. The output of these co-creation sessions was a service that personalized offers to customers based on their history and usage by utilizing an AI recommendation engine that would stay consistent across all channels. We prototyped how the service in the store, call centre, web, and promotional channels would be seamlessly integrated to deliver an easier and more tailored experience. Finally, we prototyped an unboxing experience that would help customers set up a new phone, easing some of the anxiety that might push them toward going into the store. The first step toward implementing the service was to test the new prototypes with a user group of approximately 2,000 customers. The results of this test would help build the case to scale the service experience to the company’s broader customer base. TELUS saw some dramatic results during testing of the new service, specifically, an improvement in how customers viewed the overall renewals experience. Customer satisfaction scores in this group increased by 20%, and customers consistently ranked the experience in the top two boxes of the Likelihood to Recommend (L2R) form. TELUS also saw a 25% increase in test group customers opting for lower-cost channels. We are unbelievably proud of our impact, our partnership, and the change we were able to make in this endeavor … [winning the 2017 Global Service Design Award for “Best Commercial Project”] shows that service design can have real impact in driving organizational success and change. The merit of the renewals project was recognized at the 2017 Global Service Design Awards, in Madrid, where TELUS and Bridgeable won the award for “Best Commercial Project.” Finalists for this prestigious international award are selected by a cross-section of leading service design practitioners and thought leaders from around the world, and winning projects are recognized as benchmarks of world class service design. In the end, customers in the test group benefitted from a more valuable and differentiated telecommunications service, co-created to address their pain points and preferences, while TELUS enjoyed working more seamlessly across channels and dramatically reducing the service costs. The resounding success of this initial phase enabled the team to build a compelling case to scale this innovation to TELUS renewals customer base as a whole.